Carrie Anne has been busy this year: as well as working full-time as a teacher and producing Geek Gurl Diaries, she’s created a scheme of work for Sonic Pi; she’s been active on the Government’s Computing expert panel which reviews the new Computing curriculum in the UK; and she’s working as vice-chair of #include for Computing at School. She won Talk Talk’s London Digital Hero award, and somehow she’s also fitted in the time to write what we think is hands down the best Raspberry Pi book for young people we’ve seen yet. Carrie Anne says that this book is for any young person who’s interested in making things happen using computing. Inside, you’ll find nine projects (alongside stickers, achievements and more), which will take you from a standing start to a point where you’ll be breezing through projects like writing your first programs, shaping the Minecraft universe using Minecraft Pi, designing and building your own role-playing game, writing and playing your own music…and making electronic switches out of marshmallows. It’s a beautifully produced book, full of ideas and clear direction, with a real sense of Carrie Anne’s personality jumping off every page. These projects come out of real activities Carrie Anne has worked through with real kids; they’re tried and tested – and they’re fun, too. You’ll find hints and tips to help you along the way. There’s plenty of extra material online to supplement the book, along with lots of recommendations for further reading. 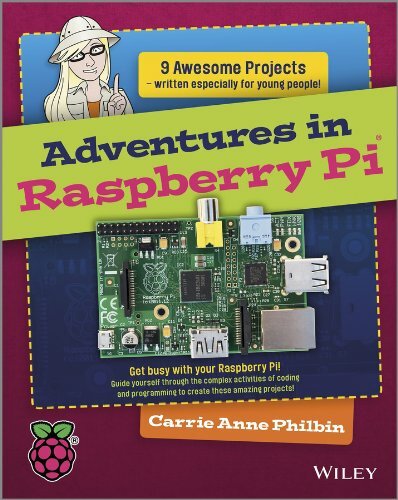 Adventures in Raspberry Pi is aimed at 11-15-year-olds, but younger kids whose parents have time for a little supervision (if you’re one of those parents, you won’t need any programming experience, because Carrie Anne’s done that work for you) will also find it a tidy fit. We’re really excited about this book. 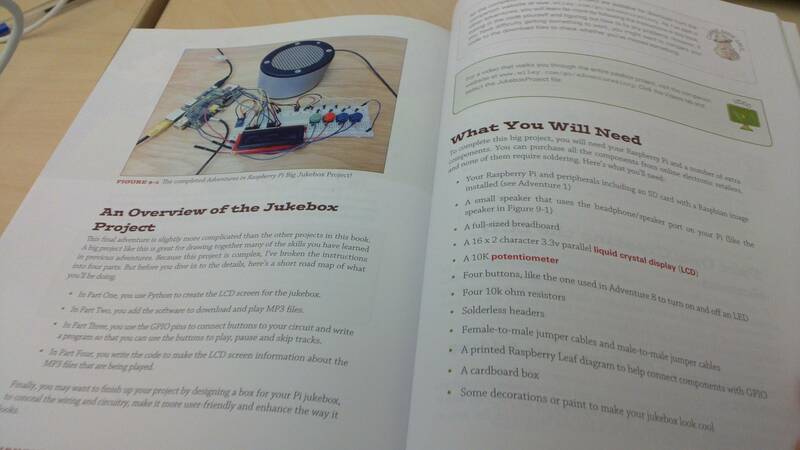 You can find it on Amazon for preorder at a discount price at the moment, for release on December 5, but if you can’t wait that long, we already have copies available here at the Raspberry Pi Swag Store (full price, I’m afraid – but every purchase you make goes to support our charitable work in computing education). I’m buying a few copies for kids I know for Christmas. I hope you will too. What are the projects in it? Excellent work! I know first hand how hard it is to write a book! Another great addition to the educational resources of the RPi, from a talented and hard working young lady. I am sure it will be a great and well earned success. Carrie Anne Phlbin is, in my opinion, not only a star, but a Super Star! My granddaughter and I are anxiously awaiting the arrival of her book! I will be pre-ordering a copy of Carrie Anne Philbin’s book. 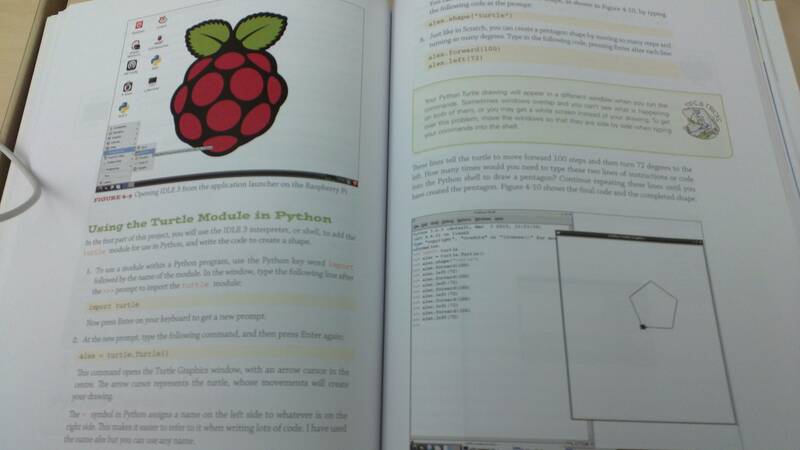 I would also like to plug Bruce Smith’s book “Raspberry Pi Assembly Language Beginners: Hands On Guide”. This very readable book gently took me from my experience of writing BBC Basic programs on my Acorn Electron in the 1980s to writing some simple ARM Assembler programs under RISC OS. The book looks excellent, always have lots of teachers asking for good starter books for kids. I think my little girl will love it too. Lots of great books coming out! I’ve just received my physical copy, and as Liz says it is an outstanding introduction for young people. It’s a shame that there’s no sample chapter available and Amazon’s “look inside” isn’t up yet because it’s a really attractively laid out book, in full colour with plenty of screenshots, diagrams, and illustrations where appropriate. I took a couple of pictures to give an idea (sorrry they’re a bit dim, it looks even better in person). We have been wondering if the guy being constricted by a snake in chapter 5 is you, Alex. I believe in this case “Any resemblance to real persons, living or dead, is purely coincidental.” I am jealous of the “Carrie Anne says…” icon though, I need one of those. I’m not sure the scared Python guy in chapter 5 is a suitable resemblance though. After all, they do call me ‘abs’ around here. I was hoping to see Turtle Graphic programming (coding) as opposed to “import Turtle” (using). But I guess that can’t be helped with these kind of books. Programming Python book by O’Reilly clocks in at 1500 pages, so not for kids. I’m curious as to what language is used for Adventure/RPG type of program? I’m building one myself using Petit Computer, and I’m just past 50,000 words, and still haven’t explained how FOR-LOOP works. For loops are introduced on the page directly after the one I took a picture of in fact (p91). I wouldn’t describe the use of the turtle graphics as “using” vs coding. The part which is being taught is the basic syntax and semantics of the Python language, and the turtle module is a really handy way to get immediate visual feedback for your attempts. The next book chapter is slightly more advanced (and standalone) Python, using it to create a text-based adventure. Thank you for your response. I’d be interested in seeing those Python text adventure programs! This looks really good – just received mine this morning and looking forward to a good read this weekend, but seems to be written in a nice, accessible style that my students should find easy to follow. I noticed that the Jukebox project uses a 3.3v LCD module and these seem significantly trickier to get hold of (and more expensive) than 5v LCDs. Given that the RW line is tied low and the GPIO pins are being used as outputs only, I think it’s probably OK to use a 5v display? (Obviously connected to the 5v pin rather than the 3.3v pin!) Can anyone confirm?! I have a question ? When the book says “Young people”, how young ? I’d like to give it a try with a bunch of kids from my community but not sure what would be a good age range. Movember: two days to go!